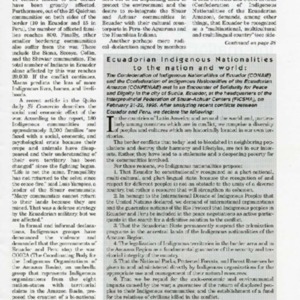 The Confederation of Indigenous Nationalities of Ecuador (CONAIE) and the Confederation of Indigenous Nationalities of the Ecuadorian Amazon (CONFENIAE) met in an encounter of solidarity for peace and dignity in the city of Sucúa, Ecuador. Suicides among the Guarani Kaiowa, which have been on the rise of the past ten years, were the main subject discussed at an assembly of the Aty Guassu Organization in Mato Grosso do Sul, Brazil. 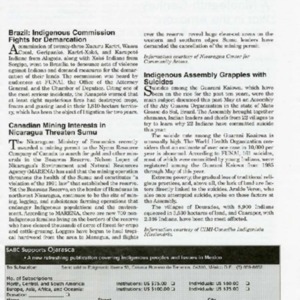 The Nicaraguan Ministry of Economics awarded a mining permit to the Nycon Resource Company of Canada, despite the risks it will have on the health of the Sumu people. 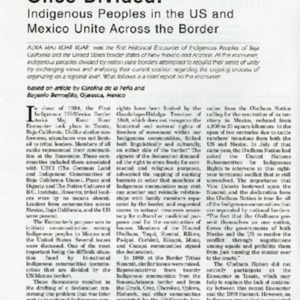 23 indigenous peoples travelled to Brasilia to denounce acts of violence against Indians and demand measures for the demarcation of their lands. Strong opposition by the Ngobe-Bugle community of Panama to the mining of their lands led to the government creating a bill that will grant the community autonomy over its territory. 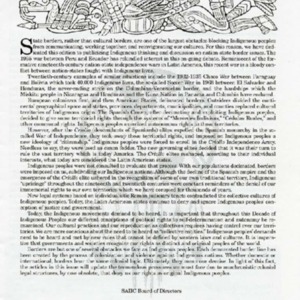 Xicaque leader Julio Soto denounced the Honduran government's failure to demarcate their lands and assure their survival. 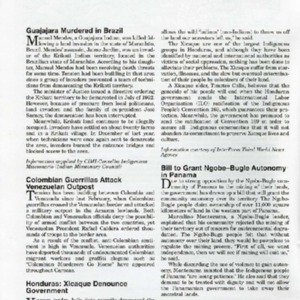 Colombian guerrillas crossed the Venezuelan border and attacked a military outpost in the Amazon lowlands. 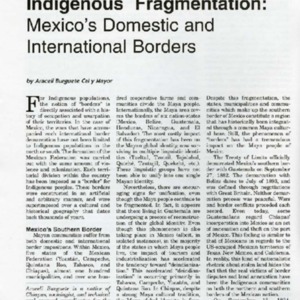 Manuel Mendes, a Guajajara Indian, was killed among growing tensions between invaders into Krikati Indian territory and the Indian population living there. 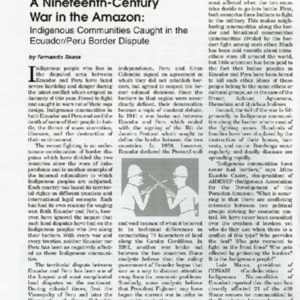 Conflict between the Ecuadorian and Peruvian border forced indigenous peoples within the disputed territory to fight for opposing sides.